Innovative technology, sophisticated materials and a perfect workmanship are typical of these speakers. Bass speakers, midrange speakers, tweeters and full range HiFi speakers of top-class quality can be combined to result in perfect HiFi systems. Bass speaker of compact size with excellent technical features, suitable for the application in bass-reflex cabinets of smallest size. Cellulose inverse cone with a rubber surround of long excursion, shielded magnetic system with drilled pole core, perfect ventilation and cooling of the voice coil via openings in the basket behind the centering spider, in the voice coil former and in the cone area where the voice coil former is glued on. Thus, a completely compression-free operation is possible. A very low limit frequency for such a compact bass speaker. 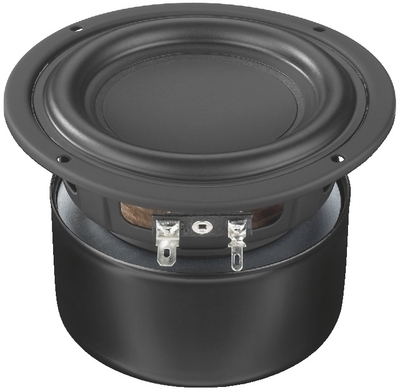 Due to the drive parameters with perfect dynamics and the medium efficiency, this bass speaker is e.g. the ideal component for the combination with small full range HiFi speakers to support them a little during bass reproduction.